Maddy Bakosh pressures Makayla Cooper as she tries to drive to the hoop. Kaitlyn McCrary puts up a shot as Karlie Winship tries to make the block. Camryn Nadir puts up a first half jump shot vs. Springboro. 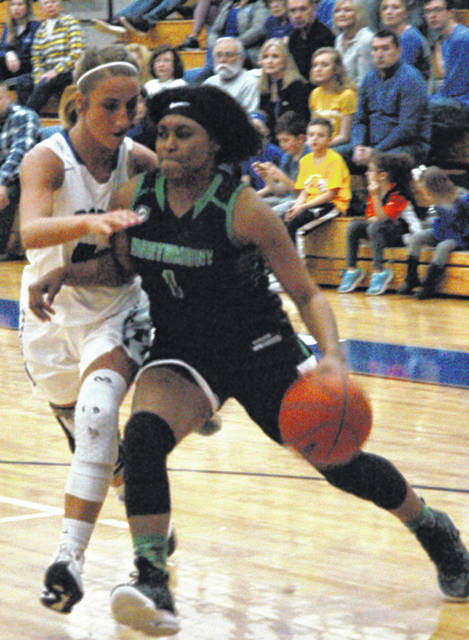 SPRINGBORO — When Northmont hosted Springboro on Dec. 5 junior guard Kaitlyn McCrary scored 11 points in the first quarter and 20 overall. Makayla Cooper scored 13 while Camryn Nadir and Shalaya Heath had 11 apiece to help lead the Lady Bolts to a 63-60 victory. 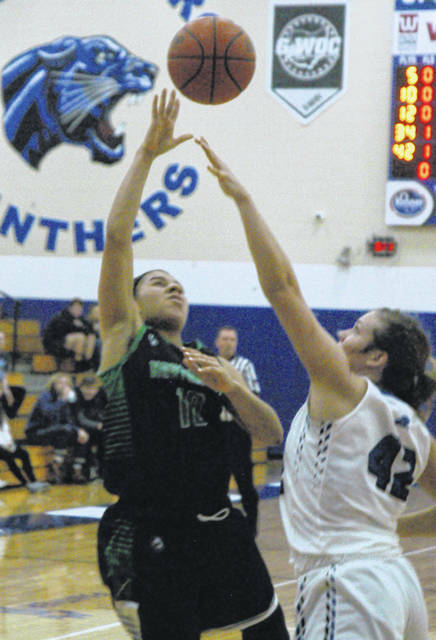 Wednesday night Lebanon throttled Northmont’s offense and not a single Lady Bolts player managed to score in double figures as the Lady Panthers scored a runaway 68-45 victory on senior night. A fired up Springboro team jumped out to an 18-10 lead by the end of the first quarter and by halftime held a commanding 23 point lead. While Springboro would storm down the court in the first half and pass the ball crisply to an open teammate Northmont players would stop and wait for the rest of the team to catch up, which allowed Springboro’s defense to seal off any possible lane to the hoop. 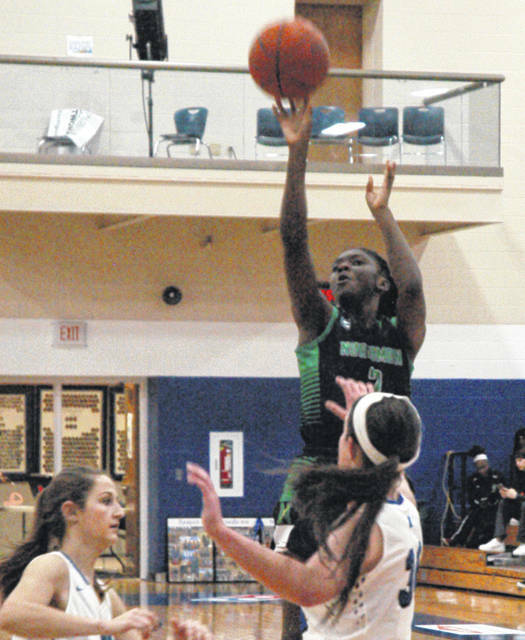 Northmont players’ reluctance to drive to the hoop and Springboro’s confidence to drive inside at will or to dish the ball outside to an open player, who would more often than not knock down a jump shot, proved costly. Springboro scored five baskets from 3-point range during the first half. By halftime the Lady Panthers had effectively put the game out of reach. The Lady Bolts played much more aggressively in the second half but couldn’t close the gap. Senior Maddy Bakosh paced Springboro with 14 points while junior McKel Nation and senior Karlie Winship each tossed in 10 to lead the Lady Panthers’ attack. The Lady Panthers play at Lebanon on Saturday and with a victory can win the division outright. Northmont closes out regular season play at home vs. last place Miamisburg on Saturday at 1 p.m. and opens sectional tournament play vs. Troy on Saturday, Feb. 16 at 7:30 p.m. at Butler High School. Northmont: Makayla Cooper 3-0-7, Camryn Nadir 4-1-9, Kaitlyn McCrary 4-0-8, Amari Bradford 1-0-2, Dasia Turner 1-0-2, Shalaya Heath 3-1-9, Gabby Kline 2-0-4, Ashley Besingi 2-0-4. Totals: 20-2-45. Springboro: Jordan Crace 1-0-3, Maddy Bakosh 4-4-14, Jordan Hobbs 1-4-6, Olivia Majors 4-0-9, Isabella Cassoni 0-2-2, McKel Nation 3-4-10, Julia Secrist 1-1-4, Rachel Gillum 4-0-8, Emily Matthews 1-0-2, Karlie Winship 3-2-10. Totals: 22-17-68. 3-point goals: Northmont 3 (Heath 2, Cooper); Springboro 7 (Bakosh 2, Winship 2, Crace, Majors, Secrist). Records: Northmont 9-12- (3-7), Springboro 12-9 (5-5).